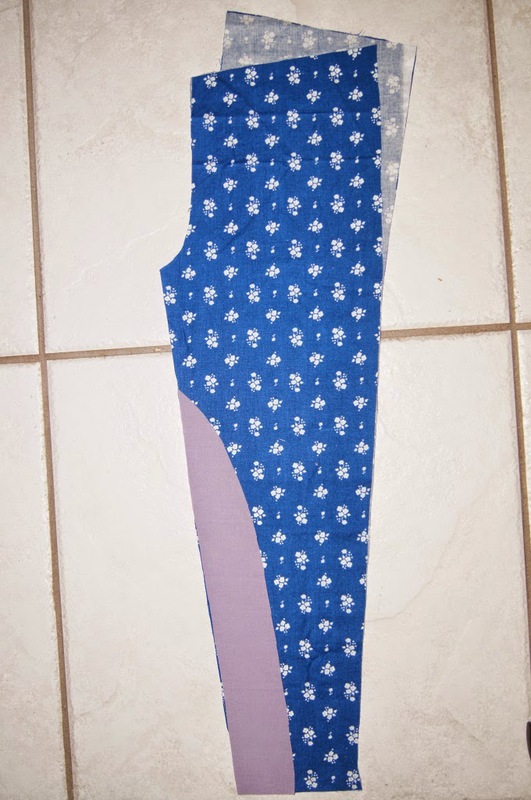 The purple piece is my cut-out from the first pair I made to show you the shape and size. 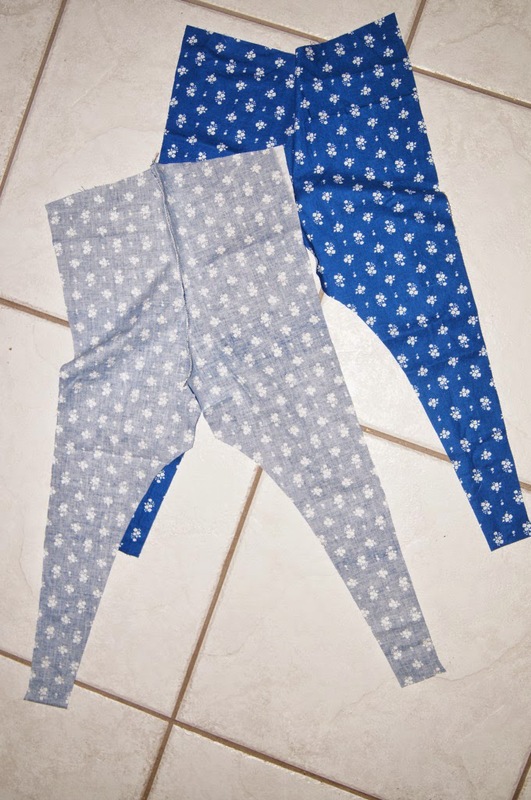 Use the Skinny Minnie pattern to cut out a pair of pants in your child's size using the woven fabric. Stack all four of the pieces on top of each other lining up the inseam from crotch to ankle. Then measure approximately 3/4 of the way up the leg - or about 1/4 of the way down from the crotch. This will be the top of your knit inset peak. You want to cut out a very elongated rounded triangle. Towards the bottom of the ankle the base of the elongated triangle cut out should be almost half the width of the bottom of the ankle. (Just look at the above picture for a reference.) 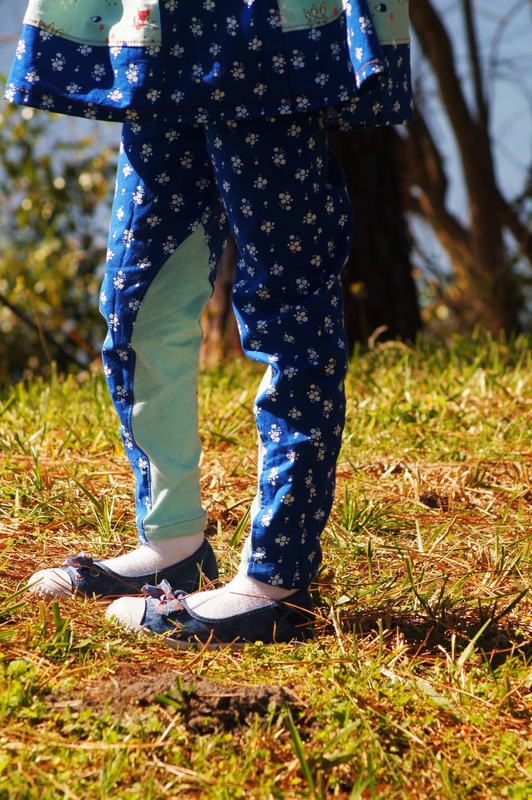 Your pants will now look like this. 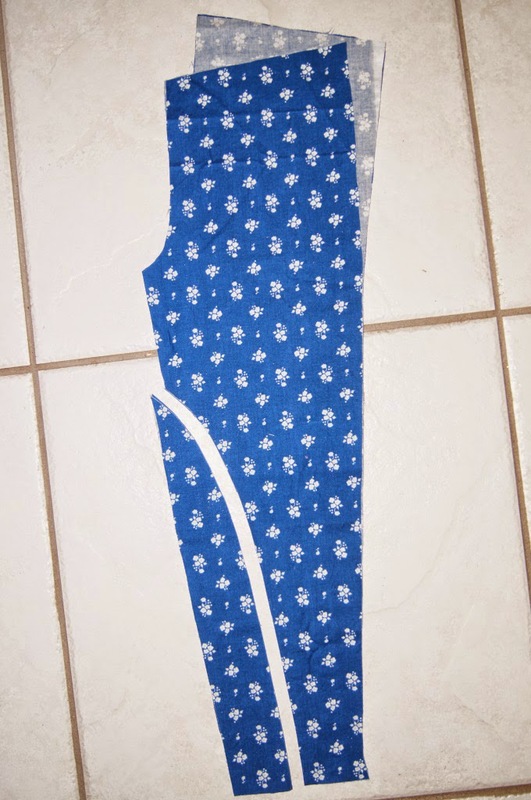 You can either toss out all but one of the cut-out pieces (because you need to use one as a pattern piece to cut out your knit), OR you can do what I did and save them all... I plan to use them as tie-straps later. 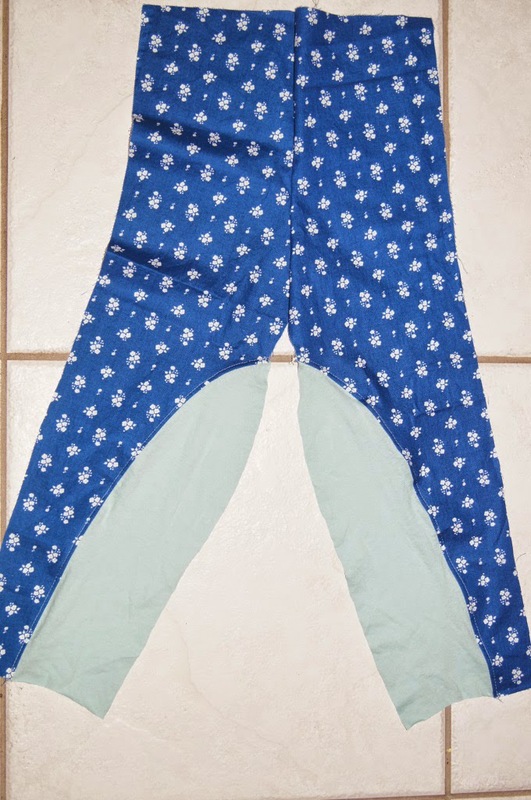 Use one of the cut-out pieces to cut out your knit inserts. Fold the knit with the greatest stretch going side to side, not up and down. 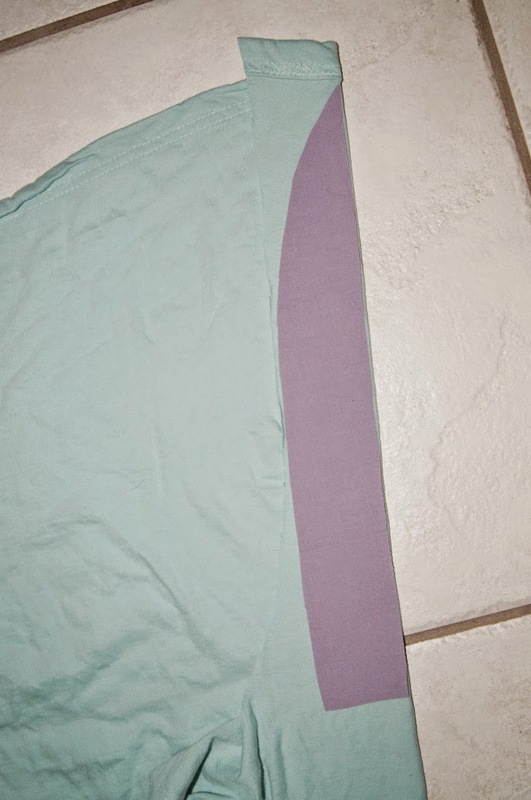 Place the cut-out along the fold. I used a jersey sheet for this. But a cotton lycra would be ideal. Do not add seam allowances. 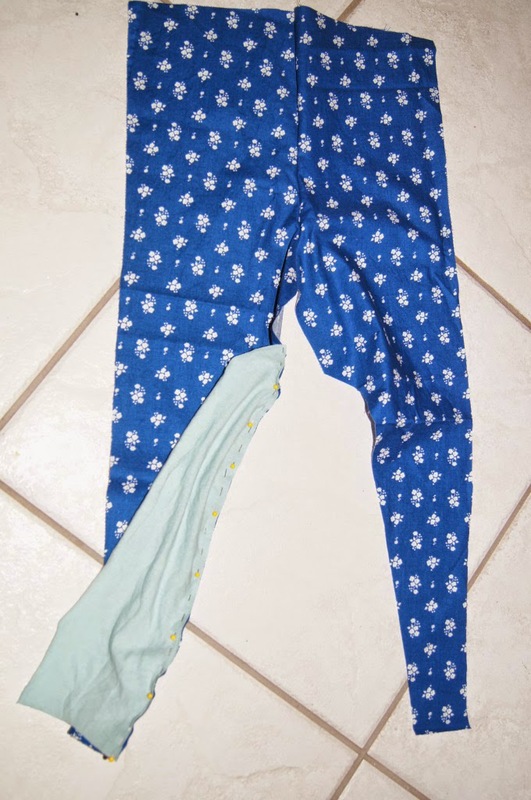 You want the pants to be very fitted and since you are using knit for the inserts no seam allowance is necessary...and it will only make the pants fit more tightly. 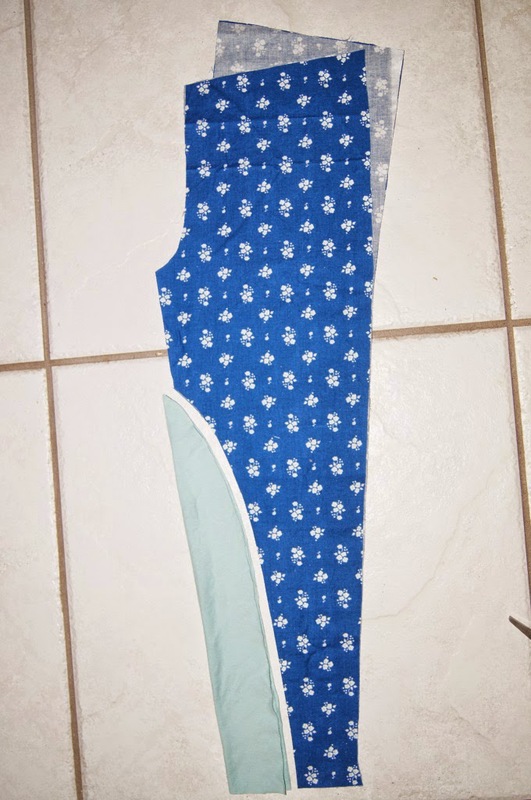 If you place the knit insert pieces into the cut-out space it will be a perfect fit. Next sew up the front and back rise. With right sides together pin the insert to one of the cut-out spaces on one of the legs. At this point it really doesn't matter if you start with the front of the legs or back. Pin from the bottom up several inches. Then pin around the curve. Continue pinning up the straight. The points of the triangle peaks should hang over the edge just barely. See pic below. When both inserts are pinned on to either the front or the back, if you open up the inserts it will look like this. 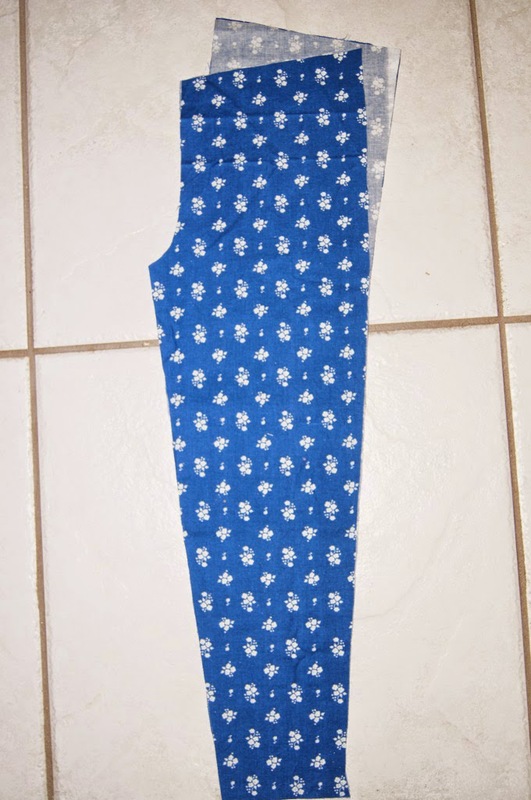 Sew down (either with a serger or with a regular machine.) 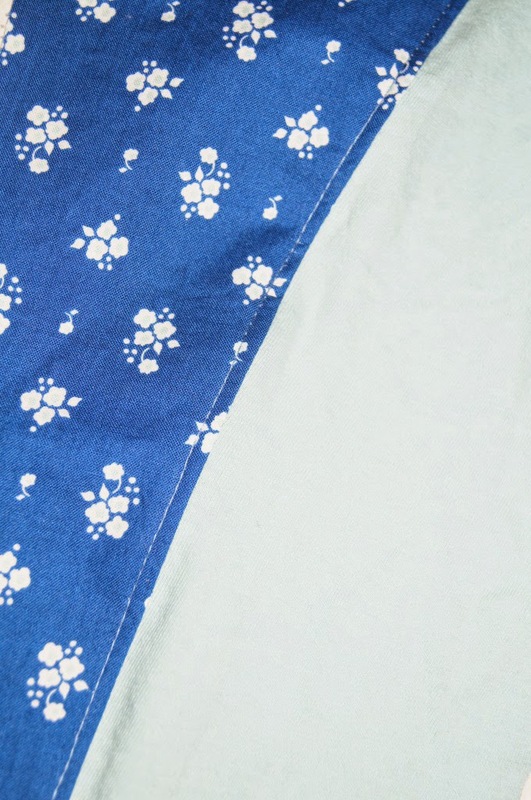 then top stitch. Pin the other side of the insert to the corresponding cut-out. 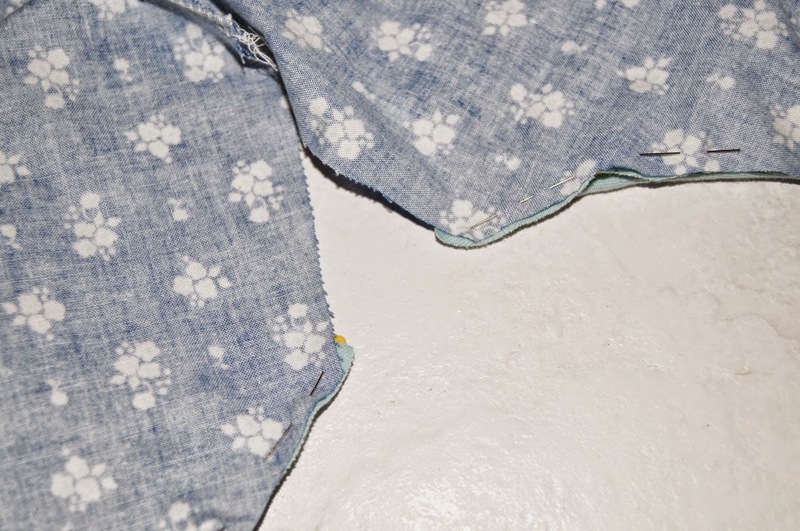 After the second side is sewn and top stitched finish sewing together the inseam. If you are going to add any embellishments then now is the time to do so. See?? 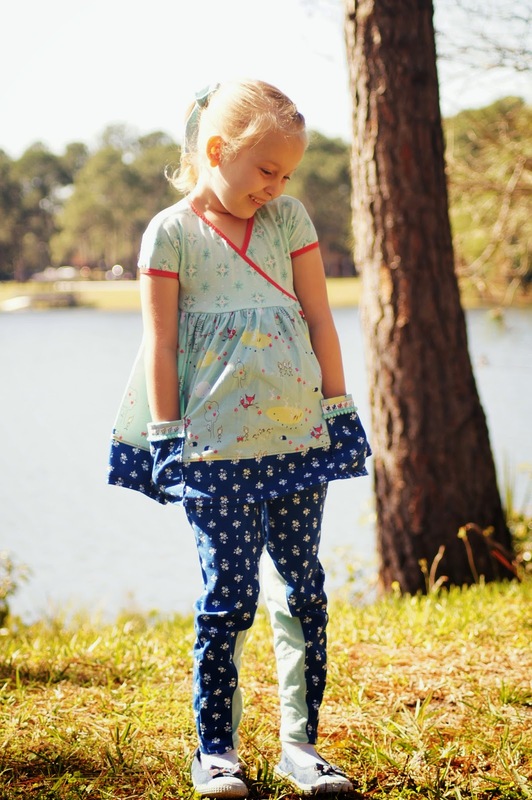 Super cute with some embellishment added! 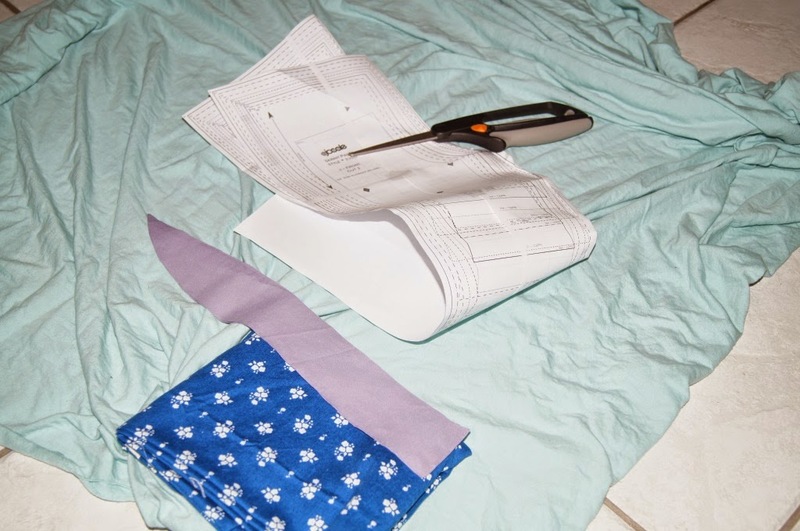 Hem the bottom of the pants, sew up the outer seam, add elastic in your favorite manner and you are done! 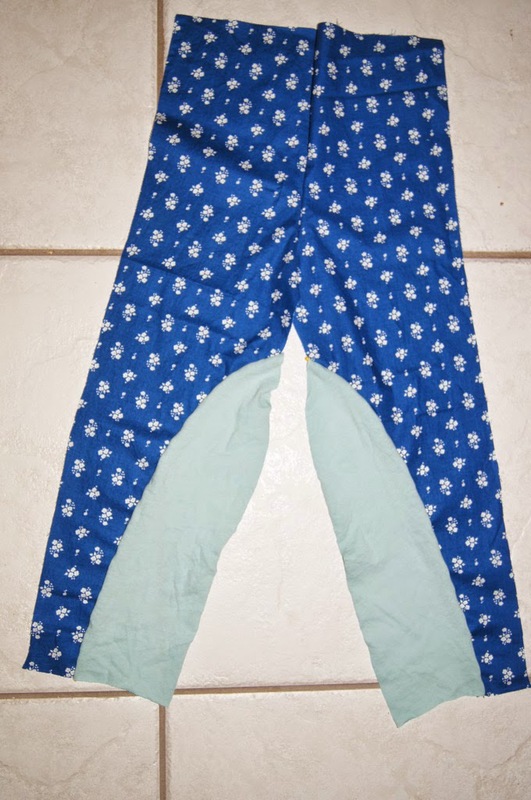 SUPER cute riding pants! Want more information on the top? Keep a look out for another blog post!! Jodi, thank you for letting me come play again! 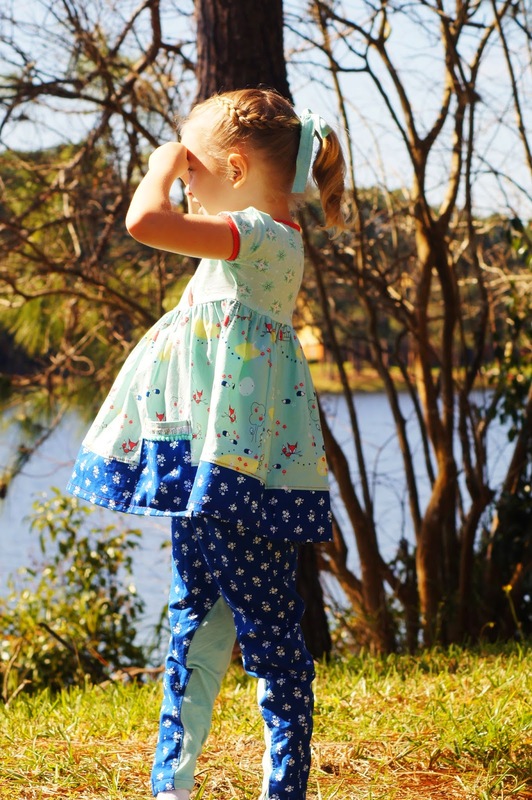 <3 Your patterns are so wonderful!